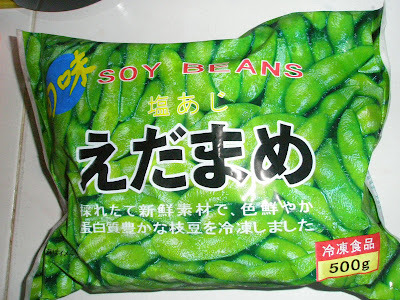 Today, Alycia and Sherilyn had Edamame beans or green soya beans for breakfast. Instead of having hard-boiled eggs again, I served them their all-time favourite food for breakfast. 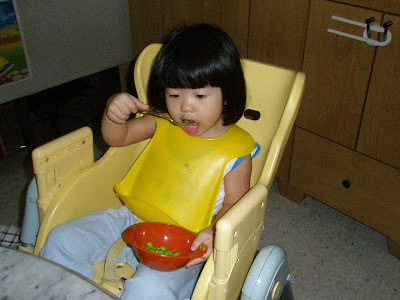 If you are lost for good breakfast ideas for your lil’ ones, try Edamame beans and they are quick and easy to prepare. Just pop them into the microwave for 1 minute 15 seconds and your lil’ ones will have a nutritious breakfast as these green beans are packed with protein, calcium, Vitamin A & C, flavonoids, fibre and low in carbo (good for dieting mummy too). 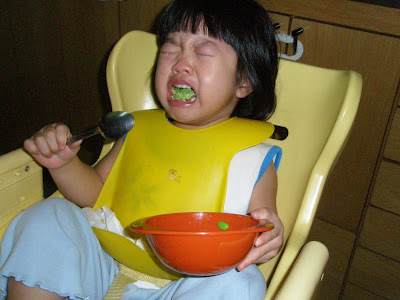 Waaaaaaah….. Sherilyn was so possessive of her green beans that when I popped just 1 bean into my mouth, she waaaaailed and wailed non-stop for half and hour…. till she puked out her breakfast…. eeeeeww. Lesson learnt… don’t meddle with your lil’ one’s favourite food. hipncoolmama… i guess all kids r like this. haha..it must be damn delicious she didnt want to share. like shern, he only shares it if it’s not his favourite. I dont heat up my child’s food using the microwave, reason being I was told that the microwave actually diminishes the nutrients in food. Just my 2 cents worth! Samantha… tks 4 visiting my blog. I’ve heard of that too but I don’t use it very often and def not for cooking, mostly on heating up food for a max of 3 mins.